Over the last few months, I have been on another book buying binge. Most of the books I have been buying are references. Many of these references help fill in some of the gaps in my knowledge. One of those gaps is how to date some foreign coins especially those of the eastern world whose language is not Latin-based. Although the Standard Catalog of World Coins has a basic reference to help figure out the date of a coin, it is not detailed enough. While there are websites on the Internet to help, there is not a single good resource. I wanted a good resource to help me grade these coins. 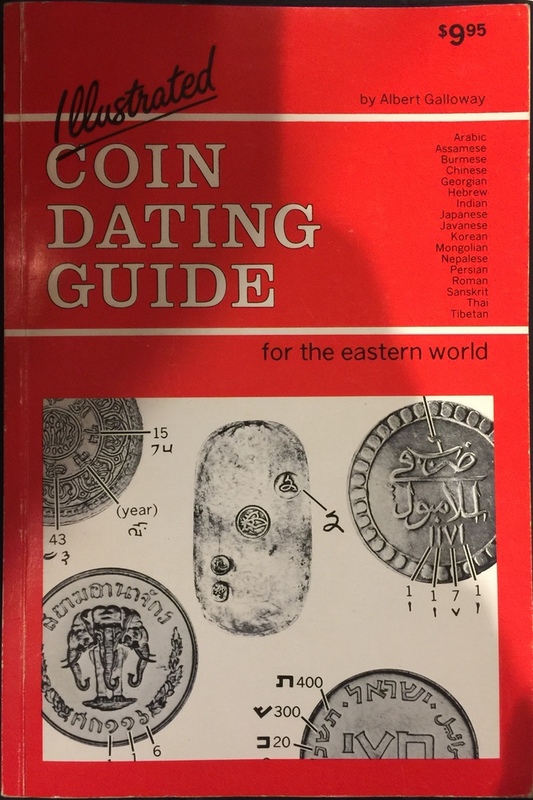 Then I stumbled across the Illustrated Coin Dating Guide of the Eastern World by Albert Galloway. Published by Krause Publications, it features the tables and descriptions that are in the Standard Catalogs on steroids plus much more information. The absolute best part of this book are the images with the guides pointing to each element to help identify the date coin. Some coins are not dated but contain the number of years of the current ruler or dynasty. Coins from Israel use the date on the Hebrew Calendar while many Islamic countries include the date of the Islamic or Hijri Calendar. And it helps in more ways than figuring out the dates. If you are not familiar with the pictograph-style writing of some East Asian countries, having in the information in front of you can help identify the difference between a Korean coin from a Japanese coin, something that recently helped me. Also, the book points out how to identify elements like mintmarks, privy marks, coiners marks, and other identifying varieties on these coins. 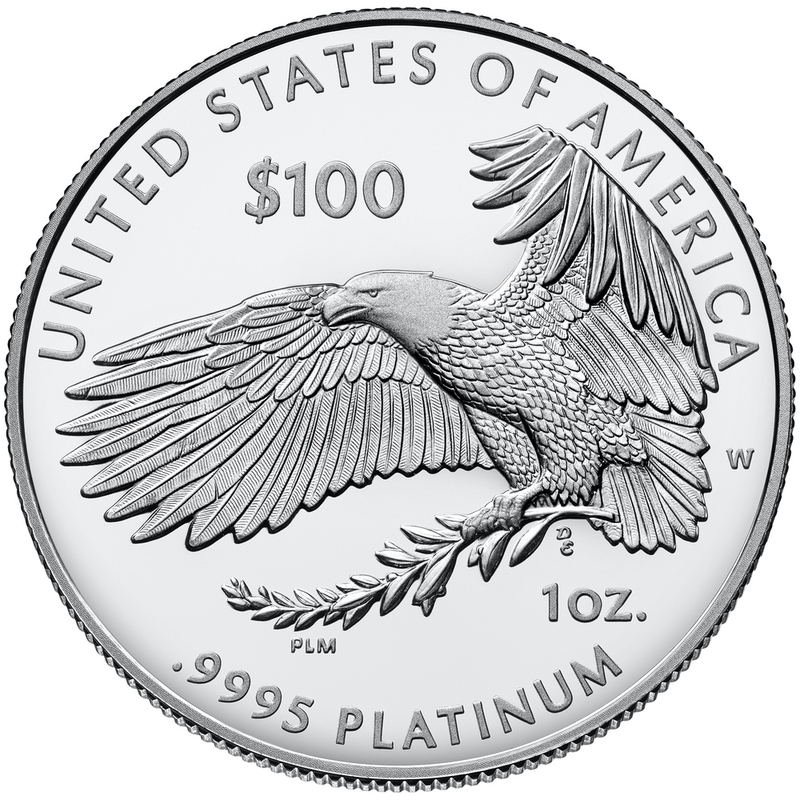 As we know, a mintmark or other distinguishing mark can make a difference in a coin’s value. The book was first published in 1984 and republished in 2012. Both versions appear to be the same with a color variation of the cover—the 1984 publication has a predominantly red cover. The only complaint about the book is that it should be spiral bound so that the book could lay flat on the table. I have not had the book long and I have already bent the spine. At this rate, the book may not last long. For that reason, I give the book a grade of MS-69. If you are searching through lots of foreign coins, this book is a must-have for your numismatic library. After my last post about the Staatliche Münze Berlin, the Berlin State Mint, a few German readers provided a lesson in the political structure of Germany to understand the institution’s role in the country’s coin production. 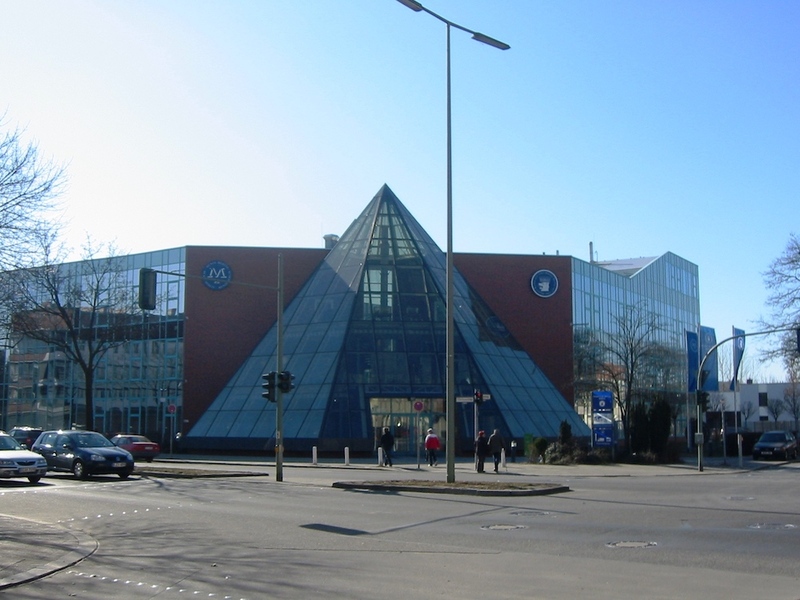 Unlike what I wrote previously, the Berlin State Mint is a government mint but for the government of the Federal State of Berlin. Berlin is one of two cities that is also designated as a state. The other is Hamburg. The divisions trace back to the many small states that existed in the region during the days Holy Roman Empire. In short, it was an attempt to bring unification to the region by attempting to allow each smaller states, kingdoms, principalities, cities, etc. to provide their own rule for the common good. Some reference suggests that there were over 300 individual governments with their own governing rules at the height of the Empire. Arguments, wars, and Napolean brought about many changes where many of the smaller states merged into larger ones and others changed by conflict. Following the Treaty of Versailles that ended World War I, Germany was forced to give up territories that left the current state boundaries were mostly set as they are today. Although the Third Reich tried to unify the country around a federal government, there were a number of administrative functions left to the states including the minting of coins and printing of currency. Even Adolph Hitler learned that to keep his version of an orderly government, he had to work with each of the states. Following World War II, the concept of the confederation of states continued with the formation of the Federal Republic of Germany (West Germany) and the German Democratic Republic (East Germany). Although the federal government has evolved with more central power, the states continue to have a degree of independence in their operations that a person with a background in United States history would consider a confederation. NOTE: First letter on the line is the mintmark associated with the mint. When the euro was introduced, German law mandated that the minting of the euro coins would be distributed evenly among the five mints. Any production beyond the federally mandated requirement to produce the euro is between the mint and the Finance Minister of the state. As for the currywurst coin, although it is produced by the Berlin State Mint, it is a product of that mint and not a product endorsed by the German federal government. If you are confused you are in good company. Even after spending parts of three days looking into the history, I am not sure I am right. It is more confusing than the structure behind the U.S. Mint! Images of the Germany state mints are courtesy of the mints via their websites. Archaeologists found fragments of ceramic coin moulds at the site when they were carrying out repairs after heavy rain in late 2017. Some of the best finds are accidental. In China, archeologists were working in an area when the rain uncovered an ancient mint in 2017. The area of discovery was not where they were searching but a staging location. With only a portion of the facility excavated, the archeologists found nine areas that could have been used as part of coin production. 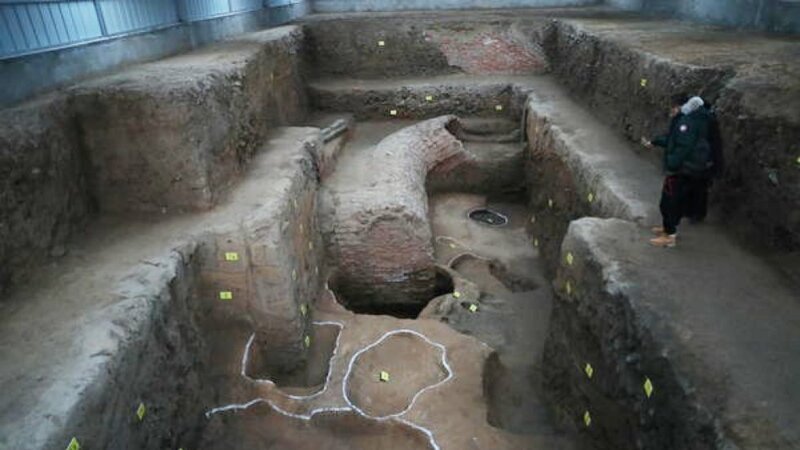 There was one kiln site that was likely used to create porcelain coin molds and eight ash pits. They also found copper coins, coin mold fragments, and other items that were used as part of the coining process. The China Numismatic Society told news sources that the inscriptions on the molds date the facility to 9-23 AD and corresponds to the reign of Wang Mang of the Han Dynasty. Finds like this shows how the use of money and numismatics can lead to better understanding of societies what may have been lost. There is always something in numismatics that can be used to teach us about history. This past week it was reported that Russian archeologists found a rare “beard kopek.” It was a coin that men had to buy if they wanted to remain unshaven under the rule of Peter the Great. Obverse of Beard Tax copper token issued under the reign of Czar Peter the Great. Reverse of the Beard Tax token. Note the off-center strike on this hammered token. Peter rose to power at the age of 17 in 1689, but the arcane succession rules of Russia did not allow him to actually rule until his mother died in 1694. Then, he had to be co-ruler with his brother Ivan V until Ivan died in 1696. That is when Peter took over. Once Peter became the sole czar he implemented sweeping reforms to modernize Russia. He thought that in order to become a power similar to those of Western Europe, Russian society had to evolve. Using western advisors and his command of the military, he forced reforms on the country including violently suppressing uprisings by those who did not agree with him. To enforce his idea of modernization, he introduced western dress to his court and required all government officials to adopt this more modern style of dress. Robes and beards were no longer accepted under Peter’s rule. In order to enforce his idea, Peter began to levy taxes on people who would not comply. If you wanted to keep your beard you had to pay a tax. Once you paid a tax you would be required to carry around a token saying that you paid the tax. The copper token found in Russia was one of those beard tax tokens. It has an image of a beard and mustache with the words “Money Paid” (in Russian) surrounded by a beaded border. If you wanted to keep your facial hair, you paid the tax and had to carry around the token as proof. Reports claim that this is only the second known Beard Tax token to exist with the other one being in The State Hermitage Museum in Saint Petersburg, Russia. 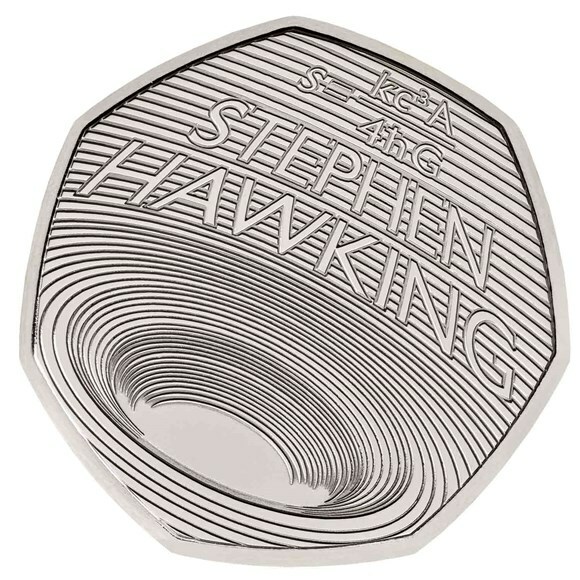 However, a silver version of the token was sold by Heritage Auctions in September 2017 as part of the Long Beach Expo World Coins Signature auction. The hammer price for that token was $3,000. Even if there were two more found, it would still be a rare token!